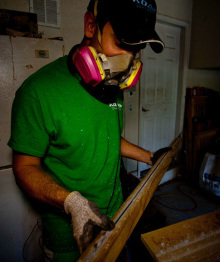 Founder of KOAH spearguns I have been surrounded by sawdust for the last 12 years. From making modifications to my first store bought spearguns to squeeze more range or tighten the accuracy, to putting countless hours into refinement of my first custom speargun until it did exactly what I wanted it to.... track, balance and drive the exact same shaft path time and time again. With a long back round in art and design I gave the guns lines and character that work hand in hand with function to produce a speargun that looked as well as it performed. With a relentless dedication to quality and product reputation, not a gun leaves the shop that I wouldn't personally shoot. Everything from the track, laminates, ballast, rubber, shafts and coatings have all been brought to the highest grade and strength to insure KOAH will live up to your expectations. 30 years in the trade Ron is an expert in the high end wood business. Owner of the Custom Wood Shoppe, nothing that is produced is cookie cutter nor replicated. As a result he has perfected many ways to cut, bend and work even the hardest woods into any shape that is needed with meticulous detail. I have put Ron to the test with some very difficult woods and even more difficult designs. Time and time again he produces the results beyond my expectations. Between Ron and I as a team of design and process we have revolutionized how custom spearguns are built from the raw lumber to high end finished product.